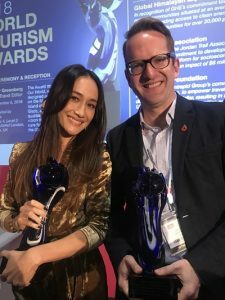 Intrepid Grouphas taken out two awards at the World Travel Market’s (WTM) Responsible Tourism Awardsin London – reflecting its commitment to using travel as a force for good. The annual awards recognise the industry’s best examples of responsible tourism, using them to educate others about what can be achieved, and challenging them to raise the bar. 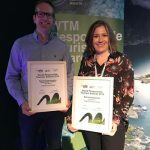 Presented to an audience of around 600 last week, the Awards formed part of WTM Responsible Tourism Day – the biggest responsible tourism event globally. Intrepid Group, the world’s largest adventure travel company, picked up Gold awards in both the Best in Communicating Responsible Tourism and Best in Employment categories. Intrepid Group CEO, James Thornton, said the awards were well-timed to coincide with the company’s milestone achievement in becoming the world’s largest travel B Corp– verifying its purpose beyond profit ethos. Intrepid’s Best in Communicating Responsible Tourism award, for the successful use of cause-campaigning to address a tourism-related issue, acknowledged its year-long Namaste Nepal campaign. The campaign saw Intrepid realise that as Nepal’s largest trekking operator, it could do more to help those affected by Nepal’s devastating earthquake in 2015. Despite raising $400,000 in its initial emergency appeal, Intrepid knew a bigger disaster would emerge if travellers stopped visiting the country post the quake – with tourism being its number one source of employment. The company explained to travellers that the best way to help Nepal was to get back there, and committed to giving all the profits from its 15/16 trekking season in Nepal back to the local people. By partnering with international NGOs like WWF and Plan to market these trips, Intrepid was able to raise a further $750,000 for Nepal, matching all funds dollar-for-dollar. The Best in Employment award recognised Intrepid Group Colombo for its efforts in ensuring decent and fair working conditions, along with employing and upskilling local people. Intrepid Group Colombo – which consists of a global service centre and local destination management company through the Group’s B2B brand, PEAK DMC – has become an industry leader in challenging the cultural normsand management practices that can impede responsible employment in Sri Lanka. In June, Intrepid Group Colombo became the country’s first-ever B Corp. The Awards also named the Intrepid Group’s not-for-profit, The Intrepid Foundation, as one of its three 2018 honourees.